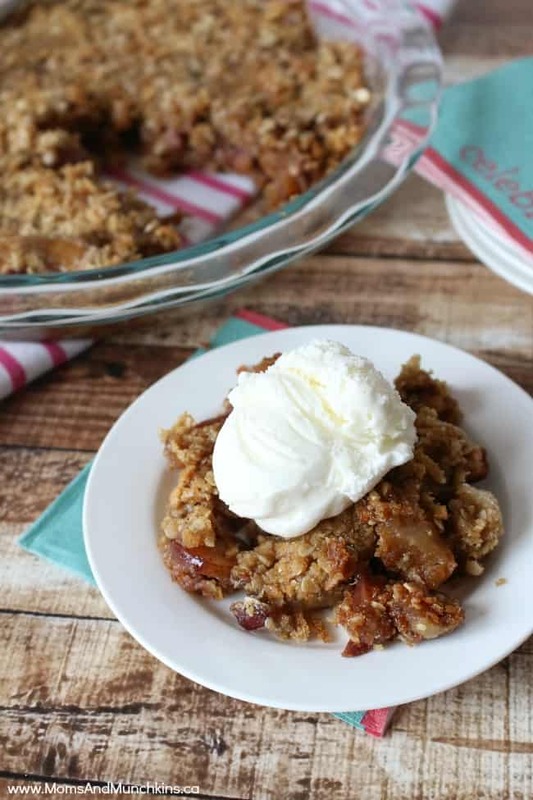 With cooler weather approaching, I’m dreaming of pumpkin & apple desserts. 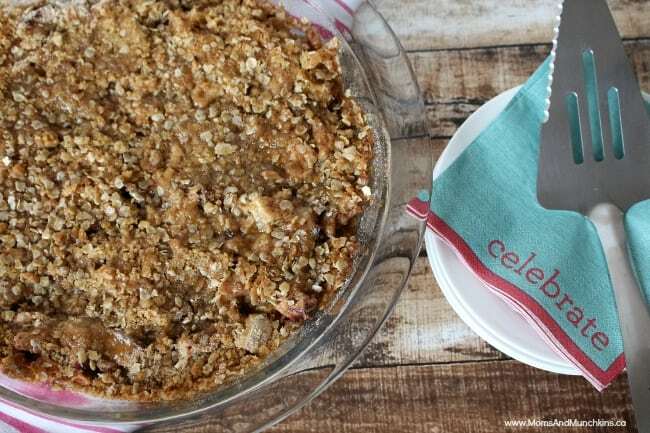 Thanksgiving wouldn’t be complete without some delicious apple desserts and this next recipe is a crowd-pleaser – Caramel Apple Crisp Pie! 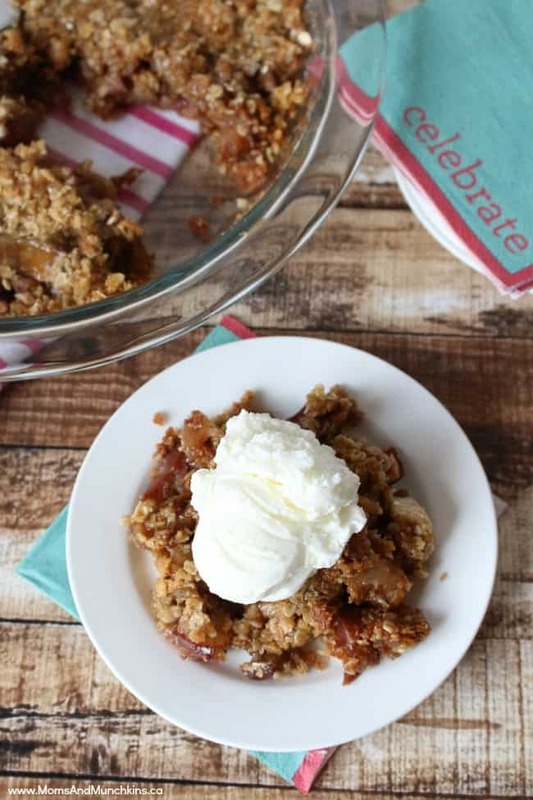 It’s just like the popular apple crisp recipe (like Grandma used to make) but with a crisp pie crust and drizzled with caramel. It’s best when served warm with a scoop of ice cream but it’s just as tasty cold from the fridge the next day! There are a few steps in this recipe but they are all easy to put together and the extra effort is worth it in the end! This recipe makes one 9" pie. For the pie crust: Mix all ingredients together in a small bowl then press into an ungreased 9" pie pan. Bake for 15 minutes then remove from oven to cool slightly before adding apple mixture. For apples: Stir together apples, sugar and cinnamon until well mixed. 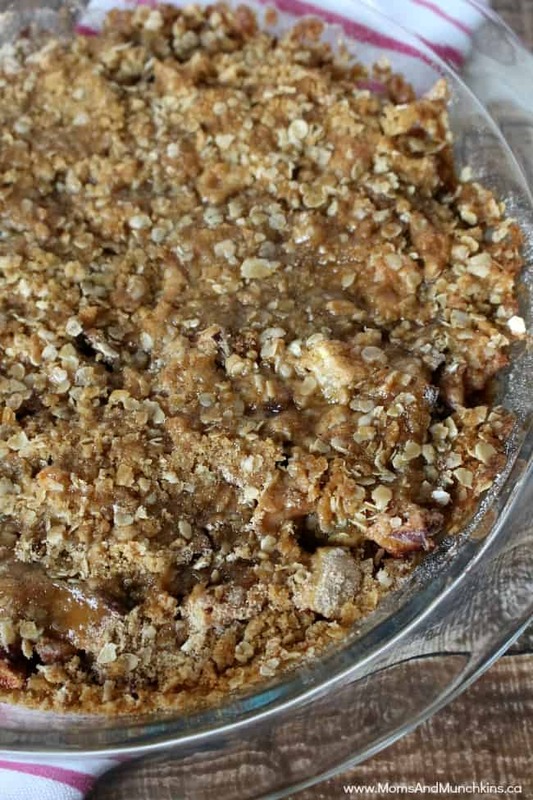 Pour apple mixture into baked pie crust. For crisp topping: Stir oats, flour, brown sugar, baking soda and baking powder together until well mixed. Cut in cold butter until mixture is crumbly. Sprinkle over apples. Bake in oven for 40 minutes. Remove from oven and let cool slightly. 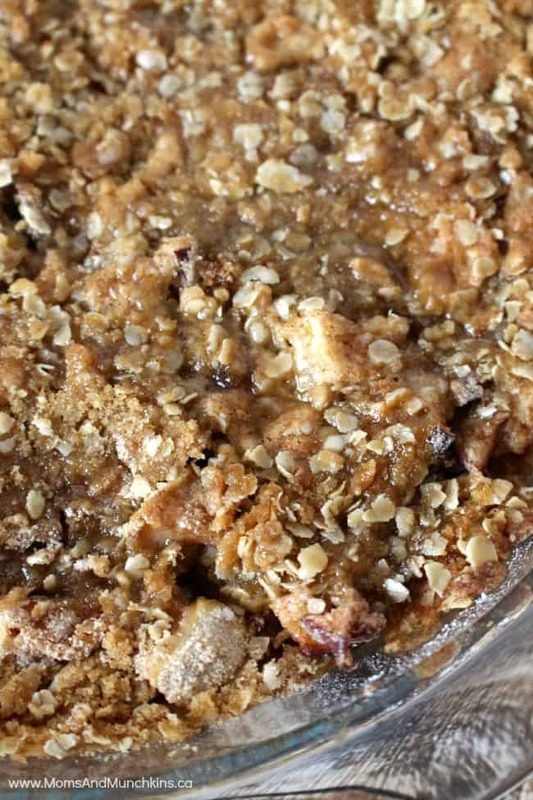 It is best served warm but it holds it's pie slice shape better when cool. For caramel topping: In a medium saucepan, melt butter over high heat then add brown sugar and cream. Stir well to mix. Bring to a boil then reduce to medium-high heat and let the mixture continue to boil for 5 minutes. Remove from heat and allow to cool. Mixture will get thicker as it cools. Drizzle caramel over pie before serving. 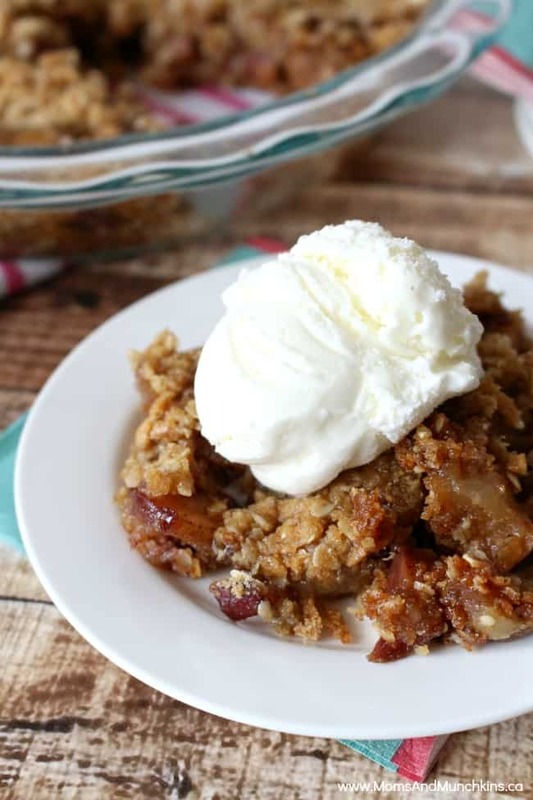 Do you have a favorite fall recipe? 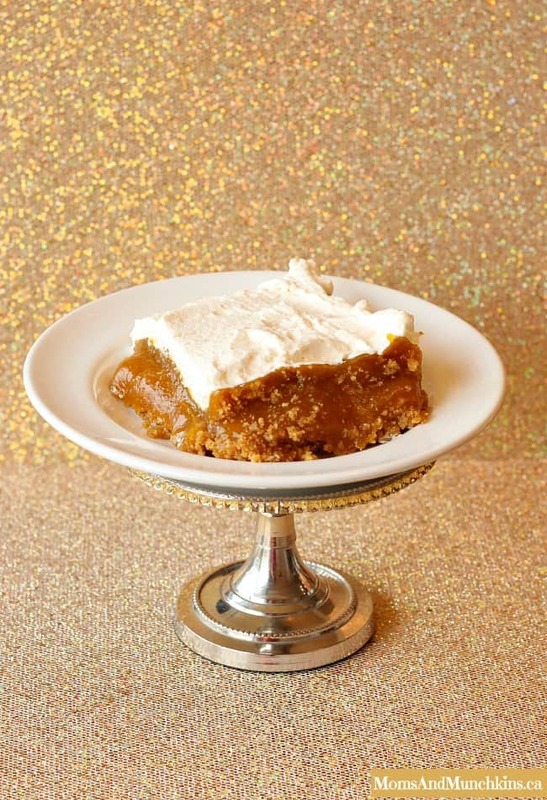 This Pumpkin & Marshmallow Dessert is one of our family favorites and we make it at every family gathering in the fall! Visit our Recipes page for even more tasty ideas. We’re always adding new recipes, party ideas and more! Follow us on Facebook, Twitter, Pinterest, Google + and Bloglovin’ for the latest updates.